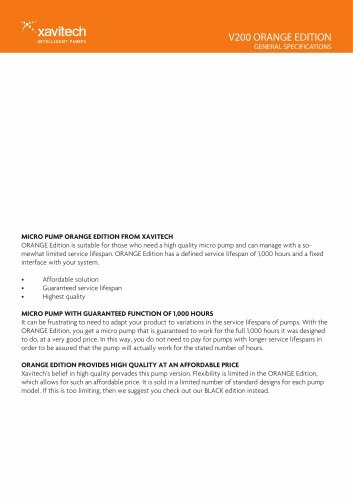 •xavitech INTELLIGENT PUMPS V200 ORANGE EDITION GENERAL SPECIFICATIONS MICRO PUMP ORANGE EDITION FROM XAVITECH ORANGE Edition is suitable for those who need a high quality micro pump and can manage with a somewhat limited service lifespan. ORANGE Edition has a defined service lifespan of 1,000 hours and a fixed interface with your system. • Affordable solution • Guaranteed service lifespan • Highest quality MICRO PUMP WITH GUARANTEED FUNCTION OF 1,000 HOURS It can be frustrating to need to adapt your product to variations in the service lifespans of pumps. With the ORANGE Edition, you get a micro pump that is guaranteed to work for the full 1,000 hours it was designed to do, at a very good price. In this way, you do not need to pay for pumps with longer service lifespans in order to be assured that the pump will actually work for the stated number of hours. ORANGE EDITION PROVIDES HIGH QUALITY AT AN AFFORDABLE PRICE Xavitech’s belief in high quality pervades this pump version. Flexibility is limited in the ORANGE Edition, which allows for such an affordable price. It is sold in a limited number of standard designs for each pump model. If this is too limiting, then we suggest you check out our BLACK edition instead.